Check Out These Custom Projects! 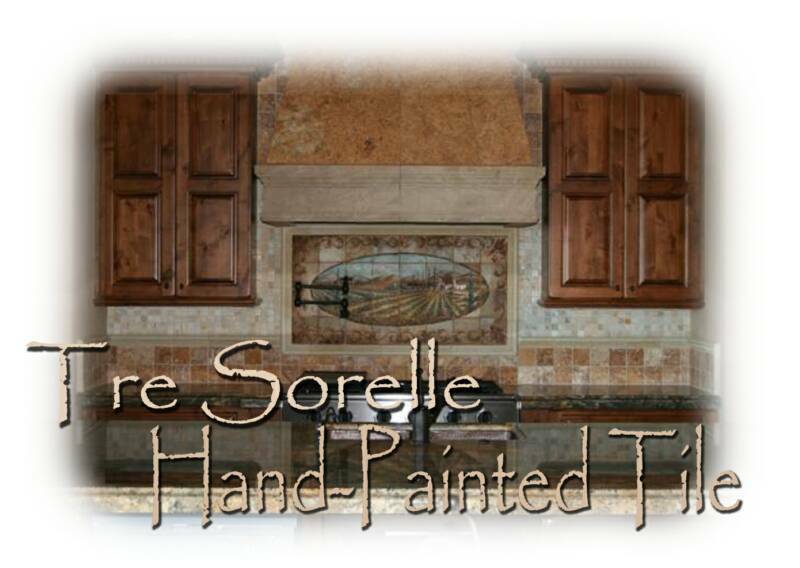 Tre Sorelle Studios hand-paints each decorative tile, accent tile, and tile mural to your exact specifications. 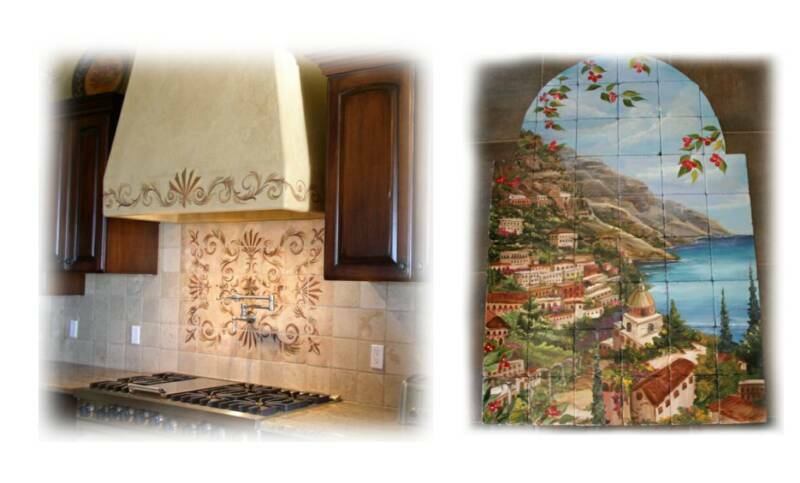 We paint our tile murals on tumbled stone, marble, travertine, or slate. Our heat-cured enamels are baked onto the stone and are washable, scrubbable, heat-resistant, scratch resistant, and perfect for your custom kitchen backsplash. Each tile mural can be customized to your exact needs by color, size, theme, etc... We also offer individual accent tiles to match your tile mural. Each tile mural project is hand-painted to order by one of the three sisters, so please allow 6-8 weeks for delivery. We add our unique artistic touch to each piece of tile, and guarantee your satisfaction. All Orders will recieve a response email, and an email upon shippment with your tracking information. 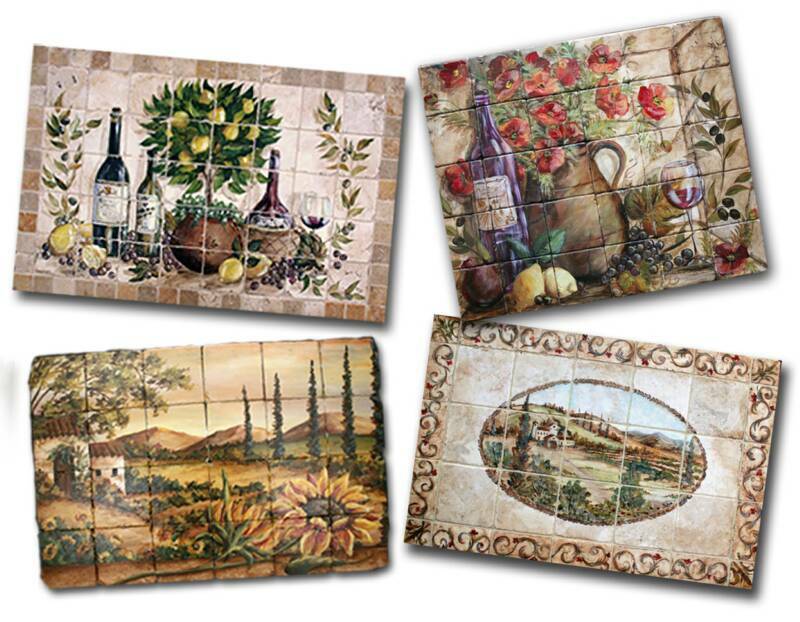 Our Hand-Painted Stone Tile Murals are unique works of art that will give your kitchen backsplash, wine cellar, bathroom, or garden distinction from the ordinary. The tile murals are hand-painted in our Arizona Artt Studios with baked on enamel paints specially made for stone tile, (water, heat, and scuff resistant) on your choice of tumbled marble or natural stone and can be customized to fit your personal style, and needed size. We are happy to create decorative accent tiles on 4" or 6" tumbled stone tiles to match your tile mural. If you dream it, we can paint it! Custom tile mural orders can be arranged directly with the artist via e-mail, fax, or by telephone. The tile murals are shipped with the tiles only (stone borders are sold seperately) to be installed by a tile installer of your choice. Check out our Gallery for items that can be purchased and shipped within 6-8 weeks. Each of these tile murals are hand-painted by one of the three Tre Sorelle artists once ordered, so please keep our lead time in mind and allow enough time for us to put our unique touch to your specific tile mural. Rush orders (less than 4-6 weeks) are subject to our time availablity and may incure additional fees. Please call for more information. We will happily customize any of the tile murals to fit your size, color, tile size and/or type requirements. Custom commissions are our specialty! Fortunately, the artist that provided the mural is painting another tile for us. She has been fantastic. We found her on the internet and has come though with every request we had - I would highly recommend her. Sarah McAnerny: www.tresorellehomedesigns.com "
"Sarah, the tiles arrived this morning…... I laid them out on my bed, oh so beautiful, and just smiled, they are oh so beautiful!.......I am still smiling as I type....Please thank the artist for me"
(Next Email)"And…..your tile mural is hanging…..and what a surprise they were YOUR tiles! ...... I am sending you a picture.I cannot believe I have been talking to THE ARTIST all along!" The tile backsplash looks great. I am so proud of it and want to thank you for such a pretty mural. I will send you a pic when I can. I have already given your name to a friend. Thanks and good luck." I'm so happy that you sent the mural now so I can pick out some deco tiles that will match it for my back splash. The mural will be a lovely addition to my kitchen." "The mural arrived yesterday while I was at work. My husband laid it out for me to see when I got home. WOW! It is so gorgeous! I can’t wait to get it put in!!! I’ll send photos when it does! "Dear Sarah, et al, I finally put together all the tiles in the right order last night. They are beautiful! Thank you sooo much. Can't wait to get them on the wall. Just wanted you to know they came in good order. Thanks again, Paul and Martha "
"Sarah, Ok, [the tile mural]it's fantastic. Wow. So, so perfect! And that champagne color is amazing the way it catches the light.....Again, thank you so, so much - it's so beautiful!!!!" "Hi Sarah,The tiles arrived and are beautiful – thank you!" "Sarah, Just wanted to say all the plates etc. (except the one grape bowl you mentioned) has arrived and all is in excellent condition. Thank you so much. Also I laid out all the tiles, just had to see how it looked. The colors are warmer or deeper than the internet pictures, and I love that, seems like it will warm the kitchen even on a cool evening. Very nice indeed. Thank you again, and who knows, we might order some other pieces in time. Appreciate all your help." "Hi Sarah, These badges just gave me the chills!...The tiles safely arrived yesterday afternoon! They are beyond beautiful and completely blew me away. I CANNOT WAIT to see them installed." "Sarah - got the backsplash. Beautiful! My wife will take a picture and send it to you. Feel free to use it if you want. Thank you so much. We are very pleased!...My wife took a picture of our backsplash for me to send to you. It's gorgeous and we get many compliments. .... Thank you so much! "Sarah,Wanted to let you know we received the tile today. It is BEAUTIFUL! It's even more beautiful in person! My husband, who is not a detail person even said, "Wow - I like the tomatoes." Thank you for making this part of our kitchen renovation so easy. You were easy to reach by phone, so helpful (sending samples, explaining your work / product, customizing my lemons :), etc. ), and so dependable (reassuring me of arrival in time, showing me proofs, etc.). Packaging was perfect - no breakage... I feel so lucky to have found you via the internet - I like your work even more than what I originally wanted and was unable to get due to it being a discontinued item -- I'm glad it worked out this way:) I have a feeling people will be asking me where I got the tiles. I will be spreading your name :) Thank you, again, Sarah. If you dream it, we can paint it. The kitchen has rightly become the focal point of the home as our fast paced and ever more casual lifestyles lead us out of the dining room to the kitchen island, the breakfast nook, etc. That’s why it’s so important that we choose the right materials for this beating heart in our home, including cabinetry, appliances, hardware, flooring… and the backsplash. The kitchen is indeed the center of home life today. Parties and holidays inevitably drift into the kitchen as guests intermingle with the host, and the preparation of the food and drink becomes part of the curiosity and celebration, and the center of conversation. Children interact with parents after school at the kitchen island, laying out the days projects and homework as Mom or Dad prepares an afternoon snack. Even in the midst of our most hectic days, as we breeze through and throw on a ten-minute skillet meal, we want our kitchens to make an impact, to ground us as we nourish our bodies. A beautiful backsplash (the area above the cooktop and/or kitchen sink, and the area between upper and lower cabinetry) can be a terrific design accent that adds immeasurably to the enjoyment of a kitchen. It is extremely important that this focal point have both a lovely form and be extremely functional. Most states have strict regulations for new buildings and remodeling projects to ensure that the proper materials are installed above the cooktop area to make it flame resistant. These surfaces may include stainless steel, granite, ceramic or stone tile, or specially prepped and painted drywall. The surface should also be easy to clean, as cooking liquids, grease splatters and smoke will most likely need to be wiped away on a regular basis. One of the best and hottest trends for kitchen backsplashes is the use of natural stone. This beautiful and versatile material has many desirable attributes. Tumbled edged travertine, marble, slate and other stone tiles possess a natural beauty that lends itself to a more rustic look than traditional ceramic tiles. Stone comes in gorgeous shades that usually blend well with many materials and colors, since the natural earth tones contribute to a neutral background for your decorating palette. The overall rich, rustic look evokes a casual sophistication that is so desired today by interior designers when they use organic and natural materials. Natural stone tiles can readily be found in 6″, 4″, and 2″ squares, subway tiles and mosaic cuts. Border moldings and listellos are now also easy to find in complimentary stone materials, in a variety of shapes and sizes including rope, crown, dentil and pencil moldings. Another of the hottest design trends for the kitchen backsplash is the use of tile murals. Hand-painted stone tile murals add drama and color, and they blend flawlessly with surrounding field tiles, or they can be set apart by the right stone molding. Hand-painted stone is unique in that the texture and inherent nature of the stone will show through in areas of the mural, lending again to the rustic look that is so desirable. Hand-painted tiles are also a terrific choice because most artists are willing to customize the murals in size, color and choice of stone. It is extremely important that the home builder chooses a reliable tile mural artist who has perfected the art of stone painting, not only to ensure that the mural is installed undamaged but that the paints used can hold up to heat and washing. Because stone painting is not a common trade, many artists keep the details of their proprietary painting processes private. However, the wise homeowner will want to see references, pictures of installed pieces and a guarantee from the artist that the tiles will be durable. If the tiles can withstand the grouting process (in which a great deal of sand, chemicals and moisture are rubbed over the mural), then the buyer usually can feel comfortable that the mural will last. However, be sure not to use harsh cleaning chemicals or abrasives such as steel wool on your mural if not recommended. Some printed tiles may not withstand heat, and some varnishes may not withstand the heat and/or abrasion of the grouting process, so be sure to look into the artist’s process, and never be afraid to ask questions. To lend function to the beautiful form of natural stone, it is important that the stone and grout be sealed after installation. This will ensure that cooking liquids and the like will not stain the often extremely absorbent stone and grout, and will make clean up very easy. Stone and grout sealers are readily available, and generally require 2 - 3 easy brush-on applications. The installer should wipe away any excess sealer before it dries to eliminate pooling and spotting. The stone has been sealed properly when water pools on the surface instead of being absorbed. Homeowners may want to check periodically (every 2-3 years) to see if another layer of sealant should be applied. General use sealers are easy to apply and clean up with water. If the installer uses a color enhancing sealer, then clean up and application will be a little more difficult because the sealer is solvent-based rather than water-based. In that case, just follow directions on the bottle. For extremely absorbent or pocked up stone, the installer may want to use a grout release or pre-grout seal to ensure that excess grout and haze wipes away quickly and easily. Natural stone and stone tile murals for the kitchen backsplash are a terrific addition to other natural organic elements in your kitchen design. With the right stone, rich granite, metal or iron hardware and beautiful wood cabinetry a homeowner can achieve a beautiful, rustic elegance in the kitchen, thanks to the amazing elements provided by Mother Nature herself.